Between Weathers Director Jim Brown has exclusively revealed that Shetland boat builders Ian Best and son Tom have been working on two stunning Yoals which are set for a starring role in the movie. We thought we would share with you these great pictures of the Golden Gleam and the Silver Spirit, two of the stars of Between Weathers. The Yoals were named after one of our Executive Producers, Shetlander George Stroud’s, grandfathers boats. The boats are currently being built by Ian Best and his son Tom on Fair Isle and will take centre stage in the film when Thomas and Charles race them through the caves below Fustra in a winner takes all climax to the picture. The attention to detail on the Yoals has been uppermost in everyone’s minds, these traditional boats have been built in a traditional way using traditional materials. 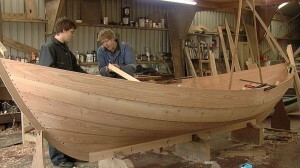 We are delighted we have been able to commission these boats to be built on Fair Isle. It demonstrates our ongoing commitment to the Shetland Isles. 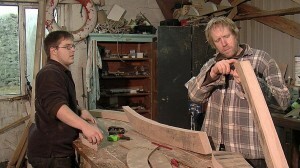 We have been filming the entire building process and will share some of that with you soon. In the mean-time click on the thumbnail images in this article to see photographer Liz Musser’s images in all their glory! We have also created a gallery of Liz’s pictures.